A deep, extensive root system helps cool-season grasses build up reserves to get through the winter, green up top growth in spring, and minimize vulnerability to insects, diseases and summer drought. Nutrients released from the soil, grass clippings and late season fertilization (feeding) will promote root growth. nutrients are usually adequately available when the pH is in the proper 6.0 to 7.5 range. 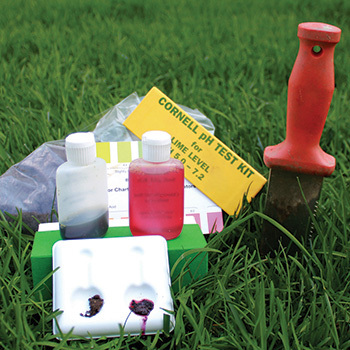 N levels fluctuate depending on soil conditions and biological activity so soil testing provides a good measure of the availability of P and K but not N.
The soil test results are the basis for choosing a fertilizer product with the necessary P or K. Only if P is low should a fertilizer with P be used. Only if K is low should a fertilizer with K be used. 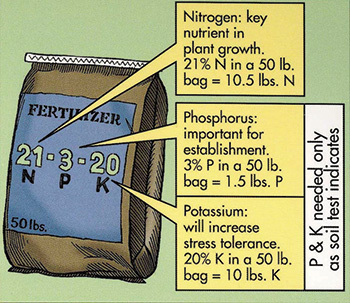 If both P and K are need, a complete fertilizer with N, P and K can be used. Follow standard N recommendations. Never apply more than 1 pound of nitrogen (N) per 1,000 square feet (about 32 feet by 32 feet) per application. alternatives to lawn in shade. Have limited traffic/use, are mowed at 3 to 3 ½ inches. with clippings left in place without clumps and do not receive supplemental water but may receive targeted pesticide spot treatment as needed. Better Lawns: Receive more traffic/use and care along the same as detailed for good lawns. Highest Quality Lawns: Used very often for outdoor activities and intensely managed to keep grass shorter than recommended and clippings removed. Pesticide applications are used as needed to address identified weeds, insects or diseases. Organic fertilizers contain carbon and are derived from living organisms. Corn gluten meal, feather meal, composted manure and bio-solids are examples of natural organic fertilizers derived from plant and animal residue. Using nitrogen (N) from organic sources is usually more expensive because by volume they have lower amounts of available nutrients. Warm (higher than 65°F), moist soil with microbial activity is needed to release nutrients. Also many compost sources are high in phosphorus and far exceed plant needs. When compost washes off site it is a threat to water quality. Though some view white clover as a weed in the lawn, it can enhance nitrogen availability. Like other legumes it is able to take nitrogen from the air, convert it to a form plants can use and release it to surrounding soil. Water-insoluble nitrogen (WIN) is a slow release source that is less likely to contaminate waterways. This includes the synthetic organic fertilizer coated urea (sulfur coated or polymer coated). On non-sandy soils use a fertilizer containing at least 30 percent slow release N.
On sandy soils use a fertilizer containing at least 60 percent slow release N.
For best test results collect a representative soil sample. Use a soil corer or a trowel to gather 10 to 20 subsamples at a consistent depth from a uniform area (for example from a problem area). Let air dry then submit the different samples to a soil testing lab to measure availability of phosphorus (P) and potassium (K) and pH levels. A simple kit will measure pH only. Lime is used to raise the pH when the pH is 6.0 or lower. Sulfur or acidifying fertilizers (like ammonium sulfate or ammonium nitrate) are used to lower pH when the pH is above 7.5. Modifying the pH is easiest before planting when material can be mix into the upper 4 to 6 inches of soil. 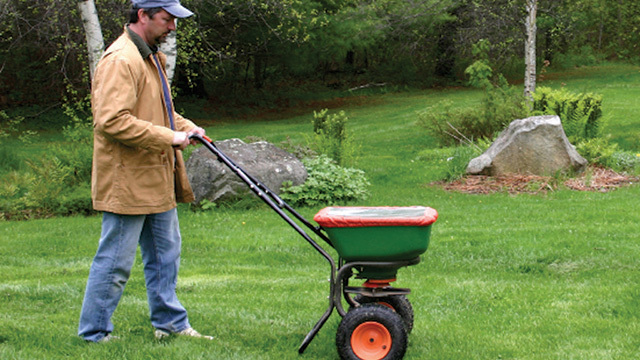 For established lawns, scatter material on top and water in. Apply only the recommended rate. If more than 50 pounds of lime per 1,000 square feet is required split the application and apply the second half in 3 to 6 months. Check soil pH before planting and every few years. Keep pH in 6.0 to 7.5 range. Restricting the use of lawn fertilizer containing phosphorus (P) is aimed at reducing the amount of phosphorus that makes its way to lakes and streams through runoff. 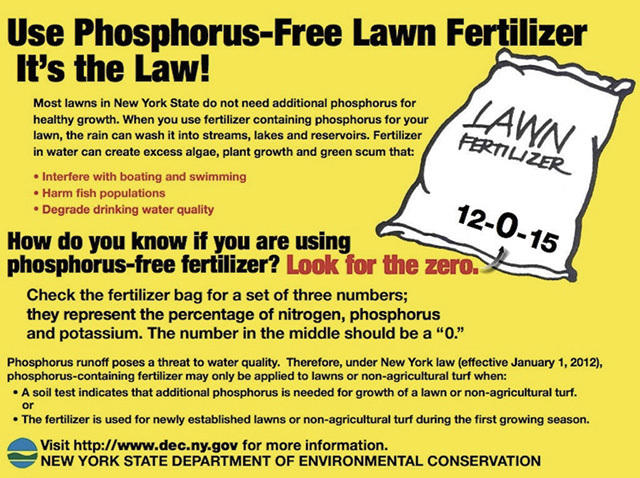 Do not apply any fertilizer on lawns between December 1 and April 1 (Suffolk County November 1 to April 1, Nassau County November 15 and April 1). Fertilizer is most likely to run off frozen ground and water saturated soil to then contaminate waterways. Fertilizer spilled on surfaces (roads, driveways, sidewalks) must be swept up immediately to avoid being washed into storm drains. Do not apply any fertilizer within 20 feet of a water body. You must use a drop spreader or one with a shield. Do not fertilize if a heavy rainfall is expected within 2 days of application. Do lightly water the lawn with about a ¼ inch of water to wash the fertilizer off the grass blades and into the soil. Read more about the New York State Runoff Law.